MEMPHIS, Tenn. (AP) The Golden State Warriors not only lost to the Memphis Grizzlies, they lost their cool in the closing minute. Stephen Curry and Kevin Durant both were ejected with 43 seconds left Saturday night, a fitting end to a frustrating night for Warriors in a 111-101 loss to Memphis. ”My pockets will be a lot lighter for sure,” Curry said about the ejection after thinking he was fouled and throwing his mouthpiece. Durant may draw additional penalties after it appeared he possible made an obscene gesture to the Memphis crowd. Marc Gasol had 34 points and 14 rebounds, and the Grizzlies built a 19-point third-quarter lead over Golden State before holding on for the win. James Ennis III added 13 points, and Tyreke Evans had 12 as Memphis shot 47 percent compared to 39 percent for Golden State. The Warriors shot 12 of 38 from 3-point range. Curry led the Warriors with 37 points, and Durant added 29 and 13 rebounds. Curry scored on a layup with 43 seconds left to cut the Memphis lead to 107-99 – as close as the Warriors got to Memphis in the fourth quarter. But Curry thought he was fouled on the play and threw his mouthpiece along the baseline, leading to immediate ejection, the first in a regular season game in Curry’s career. ”My frustration boiled over, did something stupid, deserved to get kicked out and that’s what happened,” Curry said. But Curry denied trying to hit official Scott Wall with the throw. With Curry headed out, Durant also was arguing and crew chief Brian Forte sent him to the locker room. As Durant was walking out along the sidelines, the Memphis fans taunted him and screen shots of the broadcast showed him with an extended finger, although some though it was an extended ring finger. A major portion of the Warriors anemic shooting came in the third quarter when the Golden State made only 6 of 22 shots. That led to 15 straight Memphis points and a 19-point Grizzlies lead in the latter stages of the third. Memphis outscored the Warriors 32-20 in the frame, holding an 88-71 lead entering the fourth. Warriors: Draymond Green played in his 400th career game. … Thompson made a 3-pointer in the first quarter, marking his 57th straight game connecting from outside the arc. … he Warriors had 20 assists, only the third time they have recorded 20 assists or less in a game since the start of last season – two of those by Memphis. Grizzlies: Memphis defeated Golden State twice last season, one of only two teams to hang two losses on the eventual NBA champions. San Antonio also defeated the Warriors twice. … The Grizzlies hold a 13-10 advantage over the Warriors since 2011-12. 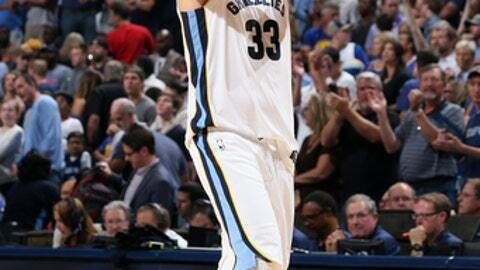 … Memphis is 2-0, only the fourth time in franchise history the Grizzlies opened with a pair of wins. BLOCK PARTY: Durant, who had a career-high seven blocks in Friday’s win at New Orleans, had three against the Grizzlies, almost half of the Warriors seven in the game. WARRIORS: Wrap up a three-game trip in Dallas on Monday with a game against the Mavericks. GRIZZLIES: Start a two-game Texas road swing at Houston on Monday. They face the Mavericks on Wednesday.